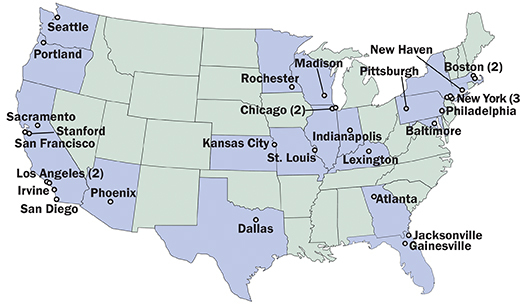 The Alzheimer's Disease Research Centers around the country are an important source of information and help for Alzheimer's caregivers and family caregivers. I often receive emails from readers asking me how to find someone that is experienced in the diagnosis of dementia, or searching for help on other Alzheimer's care related problems. When this happens, the first thing I do is ask them their location. 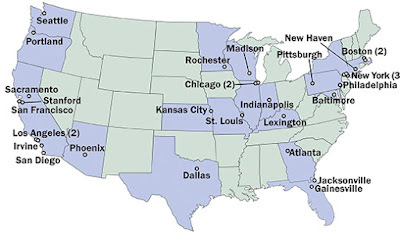 There are about 30 Alzheimer's Disease Research Centers (ADRC) around the country. When most people think ADRC they think research. However, most ADRCs have doctors in practice, practicing neurologists, a long list of resources that can benefit family caregivers, and they can help identify dementia care resources that are available in your area. The ADRC is a go to place for all Alzheimer's caregivers. Even if there is not one nearby, you can still call and ask for their help, guidance, and assistance. These centers can be very helpful to families, and I suggest if you have a problem or question you contact them. Most of the doctors and scientists are affiliated with other medical institutions in their state. So even if the ADRC is not close by, but is in your state, they can be a great resource for referrals and information. The map and list below has the location of the currently available ADRCs. The National Institute on Aging funds Alzheimer’s Disease Centers (ADCs) at major medical institutions across the Nation . Researchers at these Centers are working to translate research advances into improved diagnosis and care for Alzheimer’s disease (AD) patients while, at the same time, focusing on the program’s long-term goal—finding a way to cure and possibly prevent AD. Diagnosis and medical management (costs may vary—centers may accept Medicare, Medicaid, and private insurance). Information about the disease, caregiver services, and caregiving resources. Opportunities for volunteers to participate in drug trials, support groups, clinical research projects, and other special programs for volunteers and their families. Some ADRCs have satellite facilities which offer diagnostic and treatment services and research opportunities in under served, rural, and minority communities. Director: Sheldon M. Wolf, M.D. * The Mayo Clinic Alzheimer’s Disease Research Center has two branches, one in Jacksonville, FL and one in Rochester, MN. * The Mayo Clinic Alzheimer’s Disease Research Center has two branches, one in Rochester, MN and one in Jacksonville, FL. Washington University at St. Louis. The ADCS conducts clinical trials on promising compounds designed to improve cognitive functioning, slow the rate of decline, or delay the onset of Alzheimer's disease. The Center coordinates data collection and fosters collaborative research among ADCs. The Repository maintains a database of family histories and medical records and provides genetic researchers with cell lines and/or DNA samples.